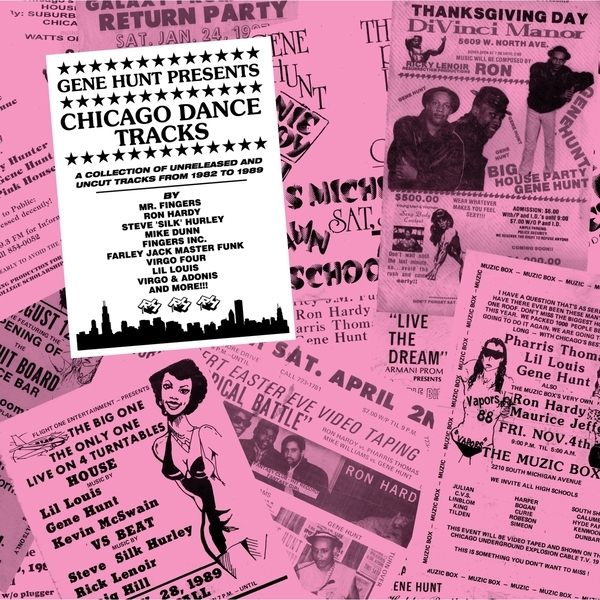 Chicago Dance Tracks is a frankly stunning selection of raw-as-f*ck, box jams culled from the personal archive of Gene Hunt. Hunt began DJing in the mid 80s when he was barely into his teens, and soon fell under the tutelage of Ron Hardy, DJing alongside him at the Hyatt Park Athletic Club and other legendary parties. Local producers would regularly hand him reel-to-reel tapes of their minimal, drum machine-heavy creations to play out in the clubs; most of these tracks never saw a proper release, and in many cases the producers in question have lost their master tapes. Mercifully Hunt has held on to them for the past quarter century, and now joins forces with Rush Hour to offer ‘em up for your pleasure in lovingly restored and remastered form. We’re not talking a cast of unknowns; oh no, it’s a virtual who’s who of Chicago dance music, with artists who subsequently became global stars captured in the embryonic and vital stages of their careers: among them Mike Dunn, Mr Fingers, Steve Poindexter, Farley Jackmaster Funk and Virgo Four. All unreleased tracks, folks. Notable inclusions are Ron Hardy’s original version of ‘Sensation’ and a walloping cut from Dion, these days best known as Kanye West collaborator No I.D. None of these stormers were considered accessible enough for release by Trax and DJ International at the time, but enjoyed huge popularity in the only space that matters – the dancefloor. This is the REAL sound of Chicago house in the late 80s and it simply doesn’t get any better. The artwork features original party flyers, artists interviews and original photos, fully fleshing out this portrait of a remarkable chapter in dance music history. ESSENTIAL PURCHASE, obviously.